where E is the energy, T is the temperature, and S is the entropy. In this example, F is the force, and R is a three-component vector specifying the position. This can be formalized using the modern notion of exterior derivative, although if that notion is not familiar to you, don’t worry about it. Everything we need to do can be explained in terms of plain old partial derivatives. In thermodynamics, it is common to have a large number of variables that are not all linearly independent. Such a situation is illustrated in figure 1. The idea is that the thermodynamic state of the system is described by a point in some abstract D-dimensional space, but we have more than D variables that we are interested in. 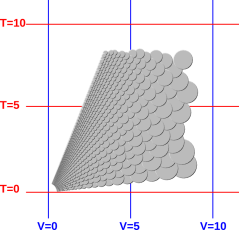 Figure 1 portrays a two-dimensional space (D=2), with three variables. You can usually choose D of them to form a linearly-independent basis set, but then the rest of them will be linearly dependent, because of various constraints (the equation of state, conservation laws, boundary conditions, or whatever). Note that figure 1 does not show any axes. This is 100% intentional. 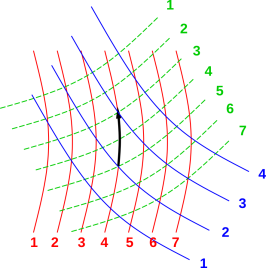 There is no red axis, green axis, or blue axis; instead there are contours of constant value for the red variable, the green variable, and the blue variable. For more about the importance of such contours, and the unimportance of axes, see reference 2. The so-called red axis would point in the so-called direction of increasing value of the red variable, but in fact there are many directions in which the red variable increases. In such a situation, if we stay away from singularities, there is no important distinction between “independent” variables and “dependent” variables. Some people say you are free to choose any set of D nonsingular variables and designate them as your “independent” variables ... but usually that’s not worth the trouble, and – as we shall see shortly – it is more convenient and more logical to forget about “independent” versus “dependent” and treat all variables on the same footing. Singularities can occur in various ways. A familiar example can be found in the middle of a phase transition, such as an ice/water mixture. In a diagram such as figure 1, a typical symptom would be contour lines running together, i.e. the spacing between lines going to zero somewhere. See reference 3 for an overview of the laws of thermodynamics. Many of the key results in thermodynamics can be nicely formulated using expressions involving the d operator, such as equation 1. What kind of thing are they? How can we visualize them? It turns out that the best way to think about such things is in terms vectors – not the familiar pointy vectors but rather differential forms in general and one-forms in particular. The details of how to deal with differential forms is explained in reference 4. However, before we get into details, let’s look at some examples. Figure 2 shows dV as a function of state. (See reference 3 for what we mean by “function of state”.) Obviously dV is a rather simple one-form. It is in fact a constant everywhere. It denotes a uniform slope up to the right of the diagram. 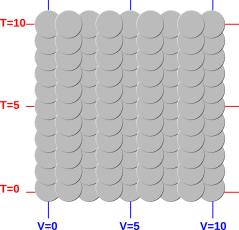 Contours of constant V run vertically in the diagram. Similarly, figure 3 shows dT as a function of state. This, too, is constant everywhere. It indicates a uniform slope up toward the top of the page. Contours of constant T run left-to-right in the diagram. Note that the diagram of dT is also a diagram of dE, because for an ideal gas, E is just proportional to T.
Things get more interesting in figure 4, which shows dP as a function of state. (We temporarily assume we are dealing with an ideal gas.) Since dP is the gradient of something, we call it a grady one-form, in accordance with the definition given in reference 4. We can see that dP is not a constant. It gets very steep when the temperature is high and/or the gas is squeezed into a small volume. For an ideal gas, the contours of constant P are rays through the origin. For a non-ideal gas, the figure would be qualitatively similar but would differ in details. The one-forms dS, dT, dV, and dP are all grady one-forms, so you can integrate them globally, without specifying the path along which the integral is taken. When these variables take on the values implied by figure 4, if you integrate them “by eye” you can see that T is large along the top of the diagram, V is large along the right edge, and P is large when the temperature is high and/or the volume is small. Mathematicians have a name for this d operator, namely the exterior derivative. But if that doesn’t mean anything to you, don’t worry about it. For more information about such things, see reference 5 and reference 6. Here’s a point that is just a technicality now, but will be important later: These diagrams are meant to portray the one-forms directly. They portray the corresponding scalars T, V, and P only indirectly. Figure 5 shows the difference between a grady one-form and an ungrady one-form. As you can see in on the left side of the figure, the quantity dS is grady. If you integrate clockwise around the loop as shown, the net number of upward steps is zero. This is related to the fact that we can assign an unambiguous height (S) to each point in (T,S) space. In contrast, as you can see on the right side of the diagram, the quantity TdS is not grady. If you integrate clockwise around the loop as shown, there are considerably more upward steps than downward steps. There is no hope of assigning a height “Q” to points in (T,S) space. In this context, exact is not even remotely the same as accurate. In this context, inexact is not even remotely the same as inaccurate. In this context, inexact does not mean “plus or minus something”. In this context, exact just means grady. An exact one-form is the gradient of some potential. Pedagogical remark and suggestion: The idea of representing one-forms in terms of overlapping “fish scales” is not restricted to drawings. It is possible to arrange napkins or playing-cards in a loop such that each one is tucked below the next in clockwise order. This provides a useful hands-on model of an inexact one-form. Counting “steps up” minus “steps down” along a path is a model of integrating along the path. The answer goes like this: Traditionally, dE has been called a “differential” and interpreted as a small change in E resulting from some unspecified small step in state space. It’s hard to think of dE as being a function at all, let alone a function of state, because the step is arbitrary. The magnitude and direction of the step are unspecified. In contrast, dE is to be interpreted as a machine that says: If you give me an input vector ΔX that precisely specifies the direction and magnitude of a step in state space, I’ll give you the resulting change in E. In equation 1 the input vector is not yet specified, so the change in E is not yet specified – that doesn’t mean that the machine is vague or ill-defined. The machine itself is a completely well-defined function of state. We could talk about applying M to a specific input and getting a specific output: O=(M ΔX). We could talk about the machine M itself. Our worst option would be to talk about the unknown result of applying M to an unknown input. This analogy is very tight. Indeed, at every point in state space, dE can be represented by non-square matrix. In the example we have been considering, the state of the system is assumed to be known as a function of D=4 variables (S and the three components of R) so the gradient will be a matrix one row and four columns. Terminology: We are treating the state of the system (X) as a column vector with D-components, or equivalently as a D×1 matrix. We are treating the gradient of a scalar (such as dE) as a row vector with D components, or equivalently as a 1×D matrix. Operationally, you can (as far as I know) improve every equation in thermodynamics by replacing d with d. That is, we are replacing the idea of “infinitesimal” with the idea of one-form. To say the same thing in slightly different words: we are shifting attention away from the output of the machine (d) onto the machine itself (d). This has several advantages and no known disadvantages. The main advantage is that we have replaced a vague thing with a non-vague thing. The machine dE is a function of state, as are the other machines dP, dS, et cetera. We can draw pictures of them. Any legitimate equation involving d has a corresponding legitimate equation involving d. Of course, if you start with a bogus equation and replace d with d, it’s still bogus, as discussed in section 3. The formalism of differential forms may make the pre-existing errors more obvious, but you mustn’t blame it for causing the errors. Detecting an error is not the same as causing an error. The notion of grady versus ungrady is not quite the same in the two formalisms: It makes perfect sense to talk about grady and ungrady one-forms. In contrast, as mentioned in section 2.2, it’s hard to talk about an ungrady differential, since if it’s ungrady, it’s not a differential at all, i.e. it’s not the gradient of anything. Let’s forget about thermo for a moment, and let’s forget about one-forms. Let’s talk about plain old vector fields. In particular, imagine pressure as a function of position in (x,y,z) space. The pressure gradient is a vector field. I hope you agree that this vector field is perfectly well defined. There is a perfectly real pressure-gradient vector at each (x,y,z) point. A troublemaker might try to argue that “the vector is merely a list of three numbers whose numerical values depend on the choice of basis, so the vector is really uncertain, not unique.” That’s a bogus argument. That’s not how we think of the physics. As explained in reference 7, we think of a physical vector as being more real than its components. The vector is a machine which, given a basis, will tell you the numerical values of its components. The components are non-unique, because they depend on the basis, but we attach physical reality to the vector, not the components. The vector exists unto itself, independent of whatever basis (if any!) you choose. In simple cases it can be represented by pointy vectors, little critters with a tip and a tail, one at each point in the field. This should be familiar to all. It can also be represented by contours, i.e. shells of constant pressure. This is the one-form representation. Closely-spaced shells represent a large-magnitude one-form. One-forms are vectors, they’re just less familiar than ye olde pointy vectors. Given a simple Cartesian metric, in any basis the three numbers representing the pointy vector are numerically equal to the three numbers representing the one-form. In simple cases there is a one-to-one correspondence between a column vector and the corresponding row vector. Returning to thermo: Let’s not leave behind all our physical and geometrical intuition when we start doing thermo. Thermo is weird, but it’s not so weird that we have to forget everything we know about vectors. However, we have to be careful about a couple of things. In particular, there is generally not any way to construct a one-to-one correspondence between a column vector and a row vector. Both types of vectors exist, but they exist in separate vector spaces. One-forms are vectors. They are as real as the more-familiar pointy vectors. To say the same thing another way, row vectors are just as real as column vectors. If you think the pressure gradient dP is real and well-defined when P is a function of (x,y,z) you should think it is just as real and just as well-defined when P is a function of (V,T). 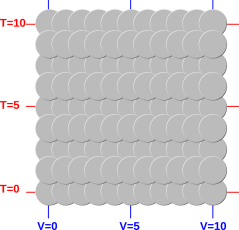 Gradients (in thermo and otherwise) can always be considered row vectors, i.e. one-forms. In non-thermodynamic (x,y,z) space you have the option of also treating the gradient as a column vector, but in thermodynamic (T,V) space you don’t. That’s the only tricky thing about thermodynamic gradients: they are row vectors only. where B is the initial state A is the final state. That is, A stands for After and B stands for Before. Before we can even consider expanding ΔE in terms of PΔV or whatever, we need to decide what kind of thing ΔE is. Since E is a scalar, clearly ΔE is a scalar. Also, it has the same dimensions as E. As always, we assume E is a function of state. So far so good. The problem is, ΔE is not a function of state. Equation 3 tells us ΔE is a function of two states, namely state A and state B.
Let’s see if we can remedy this problem. First we perform a simple change of variable. Rather than using the two points A and B, we will use the single point (A+B)/2 and the direction A−B. That is, we say the Δ(⋯) operator pertains to a step centered at (A+B)/2 and oriented in the A−B direction. This notion becomes precise if we take the limit as A approaches B. We now have something that is a function of state, the single state (A+B)/2 ... but it is no longer a scalar, since it involves a direction. At this point we have essentially reinvented the exterior derivative dE. Whereas ΔE was a scalar function of two states, dE is a vector function of a single state. dS is a vector, whereas ΔS is a scalar. dS is a state-function, whereas ΔS is not. These two itemized points are related: Changing the ordinate from scalar to vector is necessary, if we want to change the the abscissa from two states to a single state. As will be explained below, T dS is a perfectly fine one-form, but it is not a grady one-form, and therefore it cannot possibly equal dQ or d(anything), assuming we are talking about uncramped thermodynamics. Note: Cramped thermodynamics is so severely restricted that it is impossible to describe a heat engine. Specifically, in a cramped situation there cannot be any thermodynamic cycles (or if there are, the area inside the “cycle” is zero). If you wish to write something like equation 5 and intend it to apply to cramped thermodynamics, you must make the restrictions explicit; otherwise it will be highly misleading. The same goes for P dV and many similar quantities that show up in thermodynamics. They cannot possibly equal d(anything) ... assuming we are talking about uncramped thermodynamics. 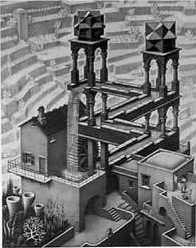 Trying to find Q such that T dS would equal dQ is equivalent to trying to find the height of the water in an Escher waterfall, as shown in figure 6. It just can’t be done. Of course, T dS does exist. You can call it “almost” anything you like, but you can’t call it dQ or d(anything). If you want to integrate T dS along some path, you must specify the precise path. What a load of double-talk! Yuuuck! This has been called a crime against the laws of mathematics (reference 8). For reversible processes, it’s easy: Every time you see dQ, cross it out and write T dS instead. Every time you see dW, cross it out and write P dV or −P dV instead. The choice of sign depends on convention. It should be easy to determine which convention the book is using. For irreversible processes, much more effort is required. Classical thermodynamics books like to say that for an irreversible process «T dS is greater than dQ». In this case, you can’t simply replace dQ by T dS because dQ (to the extent that it means anything at all) sometimes does not account for the entire T dS. In this context, it probably involves only the entropy that flowed in across the boundary – not the entropy that was created from scratch. So when cross out dQ in this context, sometimes you have to replace it by T dStransferred. where we integrate along some definite path Γ. We need Γ to specify the “forward in time” direction of the transformation; otherwise the inequality wouldn’t mean anything. It is an inequality, not an equality, because it applies to an irreversible process. At the end of the day, we find that the assertion that «T dS is greater than dQ» is just a complicated and defective way of saying that the irreversible process created some entropy from scratch. Note: The underlying idea is that for an irreversible process, entropy is not conserved, so we don’t have continuity of flow. Therefore the classical approach was a bad idea to begin with, because it tried to define entropy in terms of heat divided by temperature, and tried to define heat in terms of flow. That was a bad idea on practical grounds and pedagogical grounds, in the case where entropy is being created from scratch rather than flowing. It was a bad idea on conceptual grounds, even before it was expressed using symbols such as dQ that don’t make sense on mathematical grounds. Beware: The classical thermo books are inconsistent. Even within a single book, even within a single chapter, sometimes they use dQ to mean the entire T dS and sometimes only the T dStransferred.